Oakley are very excited to be opening the doors on the Chandlers Wharf Show home, which will open for the very first time on Saturday 26th September from 10am to 4pm and Sunday 27th September 10am to 1pm. 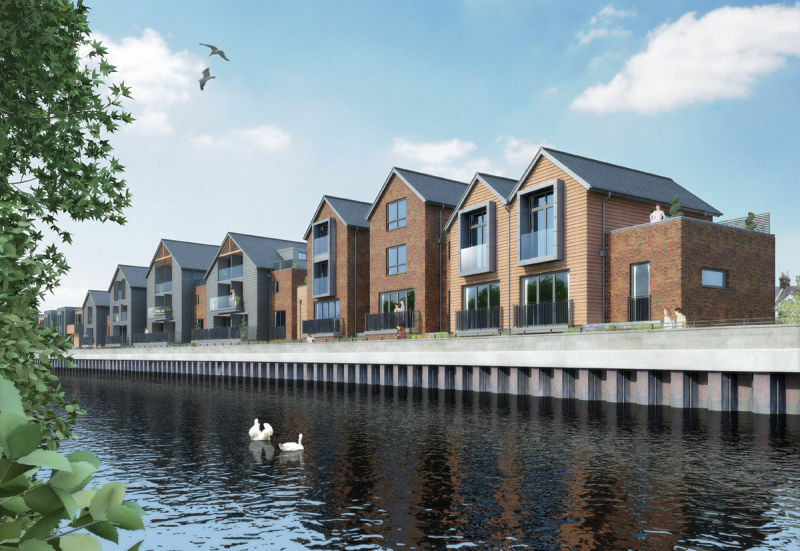 Chandlers Wharf is positioned on the River Ouse in the middle of the County Town of Lewes, the homes all have south facing views onto the River and Lewes Nature Reserve on the opposite river bank. Director Helen Oakley commented “We are all very pleased to be opening the doors on the first completed home at Chandlers Wharf and to be able to showcase it to prospective buyers. The show home is simply stunning and really shows off the beauty of this development. All the homes are due to be completed late Winter and 3 have already been purchased off plan”. Chandlers Wharf consists of 13 homes in all, each situated over 3 or 4 floors. They offer versatile living accommodation as each home has lower ground floor ancillary rooms, which could be utilised for growing families, hobbies or those working from home. “Now everyone who wanted to see a finished home can view the Show Home and see the very high quality of the finishes, the views, fantastic light levels, and the space and options these homes have to offer. The other unique advantage is to be so close to Lewes Town Centre, literally a short walk to the lively hustle and bustle of Cliffe High Street, yet quiet and secluded within their own homes”. The homes offer a mixture of 1, 2, 3 and 4 bedrooms and range from 1,400sqft to over 3,000sqft and prices start from £695,000 to £1,550,000. The show home which will be available to view is over 2500sqft and is priced at £1,150,000. The show Home has 2 ancillary rooms, utility room, lower and ground floor cloakrooms, extensive kitchen, dining and living space with a terrace of the lounge. There are 3 double bedrooms each with an en suite and allocated parking. What is also unique about this house is all the rooms have south facing views. Helen Oakley continued “Please come and join us on the show weekend. To make an appointment to view the Show Home at Chandlers Wharf please call me on 01273 487444 or E mail: Helen@oakleyproperty.com to arrange a convenient time on the launch weekend or if you would like further information on Chandlers Wharf”.